We thought it would be helpful and, dare we say it, even interesting for some of you, to explain how we put together an episode of Live From Kirrin Island. That way, you lovely people who send us material know what happens to it and everything else that’s in the mix as we get from submission to the show. Apologies in advance how long it is, but a lot goes into making the show (and we were too busy script editing to have time to edit this). The show starts with the creation of “The Spreadsheet” a few weeks ahead of the recording, which we use to track every bit of material that’s been put forward for the show. Up till then, we may have talked vaguely about changing the show a bit: more or fewer recurring characters, how topical we aim for, but that’s probably in some emails we’ve accidentally deleted. A bit like the Big Bang, one moment there is a perfect vacuum with no sign whatsoever of the next show, the next moment one of the script editors has sent around the link to an online spreadsheet that all of our writing team can add sketches to. Like the Big Bang, The Spreadsheet grows unstoppably, creating comedy from nothing. Unlike the Big Bang, The Spreadsheet expands almost imperceptibly –until a day or two of the deadline (and invariably the day after) when it mysteriously balloons into a mass of hundreds of pages of new material. At that point, the script eds begin to cry and banish all thoughts of sleep. 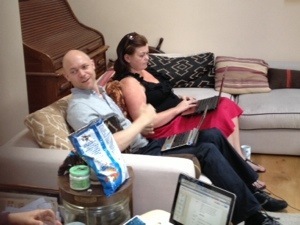 At this point, we’ll also banish all thoughts of more Big Bang similes, before we risk Writers Room Fever (see below). A big part of this miracle of comedy creation is our request for submissions from any writer who fancies getting in the show (or who fancies one of the production team – we assume there are loads of these). We ask for material here on our website and on the Writing Opportunities forum of the wonderful British Comedy Guide). Fortunately, these open submission writers are much more respectful of deadlines than the rest of us. The rest of us in this case is the dozen or so writers who work on every show, including producer Alison and the script eds. – Lack of a great premise, or where we’ve seen a similar sketch before. – Being one of many on the same subject and we already have one or two that made us do a happy nose spray. Invariably, there are a lot more “Maybe”s than “Yes”s at this stage, e.g. where there’s a good idea that doesn’t quite work but might do after a rewrite, or where we have several good sketches on the same topic and it’s too early to tell which is the winner. In the run up to Team-Writing Day, there’s lots of rewriting and more feedback gets given (possibly even conflicting feedback from script eds if a writer is really lucky). We’ll also sometimes ask our writing team to have a go at a rewrite of someone elses’s sketch where there’s an idea we love that still isn’t working. The last couple of days before Team-Writing Day are where theory splits from reality. In theory, the script eds have time to edit every sketch to make them as tight as possible and to add even more great lines (imagine the writing team laughing sarcastically at this point). In reality, loads of stuff has been submitted or rewritten at the last minute and we’ve only just started on the mini-sitcom that runs through the show, plus the Kirrin Island curse has struck down at least two people with sickness or work crappiness. So we get to Team-Writers’ Day with lots of sketches that have been rewritten at least once but still need a bit of work. What is Team Writing Day? Well, the first rule of…sorry, we’ve banned that joke now, along with “Step away from the…”. Team-Writing Day is both very fun and very scary. At the start of it, we have 20 or so draft scripts with premises we love…but invariably few or none are at the level where we’d want to record them. 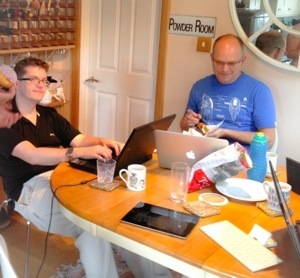 Sometimes there are some outright gaps and we quarantine a writer or two into a corner to write a sketch from scratch. Either way, we don’t yet have the show we want and we’re only a couple of days from recording. Aaargh. On the upside, we’re on an island, so at least the river is there to keep us calm, and to stop writers escaping before we’re finished. Luckily, team-writing is very fun and very effective. What we do is split into two groups of writers (normally including one or two of the cast and a couple of us who think we can act), allocate sketches to each group and then we have a great time doing readthroughs and line-by-line polishing until we think we’ve got as good as we can get on each one. Sometime stuff just doesn’t work at the readthrough and the group can’t think of a way to fix it in the time available. But most of the time things come out shorter and better due to half a dozen people throwing gags and new twists at a sketch. Sometimes there isn’t much we need to change, other times a sketch is pretty much rewritten in real time. We use Google Docs extensively which means words magically change on the screen in front of your eyes, and often when you’re half way through reading that line aloud. By now, we’re pretty good at leaving egos at the door and letting other people completely reshape our sketches if they have better ideas, so the biggest risk at this point is Writers Room Fever. For those who’ve not experienced it, Writers Room Fever is the most enjoyable illness there is, but can also be absolutely deadly to a sketch. What it comes down to is that if you get lots of funny people in a room who like each other and enjoy doing OTT acting and impressions, pretty much everything will get a lot of laughs. But sometimes those laughs were pretty dependent on somebody trying horrifically to do a Lloyd Grossman impression and the after effects of that last glass of wine. The odd sketch will also get twisted in a way that makes perfect sense to people who’ve been talking about it for 20 mins but would utterly confuse any sane member of society. What’s difficult to do is take a step back and work out if an audience will react in the same way as we have. To try and deal with that, we have a group readthrough of everything at the end of the day. Invariably at some point, either a sketch is read by different people and doesn’t seem so funny or someone from another writers group will say “So you’ve moved the Lib Dem conference to Mars, with Joe Pasquale hosting. And then One Direction turn up and burst into song?”. So invariably a few more sketches are ruled out and then we know what’s going to be recorded. Oh, and there’s one-liners as well. It’s a similar process, except we also get a couple of the best one-liner writers on the team to look through everything we’ve got from open submissions and then agree with the script editors which ones to include. We’ll also pinch any great one-liners from sketch submissions that we don’t end up using. The even better thing about Live From Kirrin Island is that as well as writers, we’re also the production team so we get to chat to the actors about ways to play the scene, explain what our incomprehensible directions meant and then watch as they make our sketches miles better than we thought possible. And we can make them try ludicrously difficult things (real example: “Can you do Nick Clegg as evil, but not too evil, and a bit horny, and singing…just make up the melody”), which they then manage, so we have to think of something more difficult. And if something doesn’t work, they have great ideas about how to fix it. There is the odd sketch that we just can’t get to work at the recording, but why it didn’t is normally a great learning experience as a writer. It’s also why we like to go into recording with a good amount of spare material. Knowing you’ll have to be there when the actors perform the sketch is about the best incentive we know for making it as good as possible, with characters they’ll want to perform. 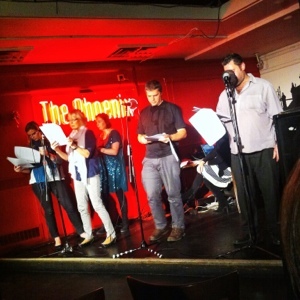 So, sketches have been written and the actors have performed them amazingly – job done. Well… There’s still quite a bit left to do. Most of it has to be done by producer, Alison. The hunt for sound effects (or F/X) and atmosphere (ATMOS) or sometimes music (GRAMS) commences. In some cases the writer has indicated “snazzy music” or worst example yet, “ATMOS: LIBRARY” and Alison has to scour the internet in her favourite places for the right pieces. Fortunately as one of the writers herself, she’s just as guilty. As time has progressed, we have aimed for ever higher production values and in recent episodes we have four, five sometimes even six layers of overlapping channels to give it real depth and substance. Tracking the used F/X etc is really important for crediting purposes. Not only is it morally right but a compliance requirement for radio stations that we appear on and awards in which we are entered. The most time consuming part of the edit then commences which is perfecting the volume balances and the timing. The more you do it, the more it becomes second nature. It’s remarkable how much difference a mili-second can make when you shave it off or put it in somewhere and it’s a case of needing an “ear for comedy” to feel exactly what’s right. It can mean listening to a sketch over half a dozen times and a big challenge is to think how it lands if you’re hearing it for the first time when you don’t have the benefit of knowing what’s going to happen (see Writers’ Room Fever above). When you scale this listening time up, you can appreciate why the edit can take so long. After annoying writers and actors earlier in the process, the script eds now annoy the producer by asking for lots of extra f/x or a different version of an obscure sound that took ages to track down in the first place. And we have to agree the final final selection and final running order. In truth the Producer is probably sick to death of editing the episode by this point and when faced with a long list of suggested improvements from the Script Eds is ready to commit murder. But we’ve become very good at working this through with comments prioritised by errors first, then big impact changes followed by nice-to-haves. It’s then a judgement call between spending more time editing or getting on releasing what is, after all, a (semi) topical podcast. We “publish” or “broadcast” and provide the edits to the British Comedy Guide and Brooklands Radio and hit the Social Networking big time – which is once again a team responsibility. We shouldn’t leave out the work we do on animations. One or two of the team have specialised in working with Muvizu and as soon as we have recorded, will think about which sketches are best suited to animate – recognising the limitations of Muvizu. We work on these in parallel to the audio edit and aim to launch them simultaneously for greatest impact. And that’s it. And after a few weeks working on all the other projects everyone’s involved in, we get itchy feet and start the process all over again.